Something smells fishy in Redondo, California. That’s right, there’s been another massive fish kill. This time, it’s not a river, but a portion of the ocean. 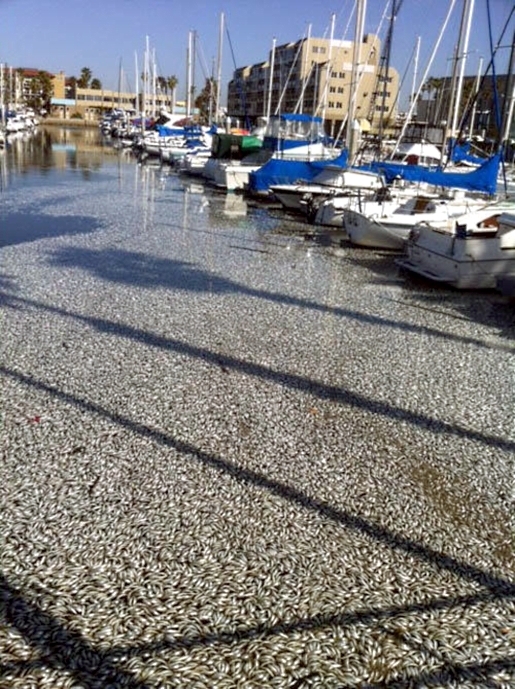 Millions of dead sardines are clogging up King Harbor Marina in Redondo Beach, California. Now, it’s up to some distressed city workers armed with shovels and scoops to make with the cleanup, a project that is expected to cost well into the six-figure range. There’s no culprit this time, no poison or disease. This fish kill was caused by, essentially, bad luck and confusion. Experts believe that the fish were pushed into the harbor by a serious storm that hit the area last night. The fish depleted all their oxygen and ended up suffocating themselves while stuck in the harbor. Hence the millions of dead sardines, and the subsequent epic stink of thousands of pounds of dead fish.